Body length 14-22 mm; forceps 5-8 mm; general colour varies from yellowish brown to dark blackish brown with intermediate shades; antennae, legs and wings generally testaceous; antennae 25-36 segmented; pronotum slightly longer than broad, sides straight or often convex, posteriorly rounded. Wing generally present; occasionally reduced or concealed below elytra; rugose above. Abdomen weakly depressed, punctulate, gradually enlarging posteriorly. Forceps remote at base; trigonal above for a short distance; long, cylindrical, tapering apically; internally toothed but their position extremely variable. Body length 12-20 mm; forceps 3.5-5 mm; abdomen dilated in middle; ultimate tergite narrowed posteriorly. Forceps with branches almost straight and contiguous; each branch narrowed distally; inner margin dentated. - Srivastava, G.K. (2003). The Fauna of India and the Adjacent Countries: Dermaptera. Part 2. Zoological Survey of India, Kolkata, 235 pp. 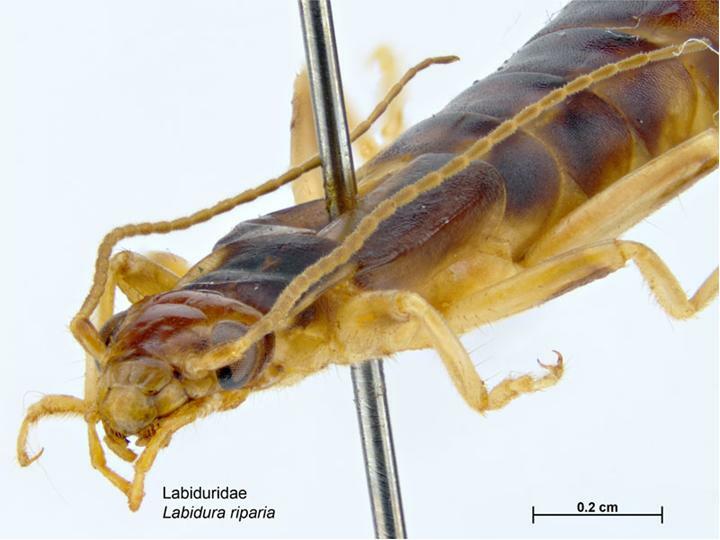 MAF Plant Health & Environment Laboratory (2010) Tawny Earwig (Labidura riparia) Updated on 4/9/2014 11:42:50 PM Available online: PaDIL - http://www.padil.gov.au.